Sat. Mar. 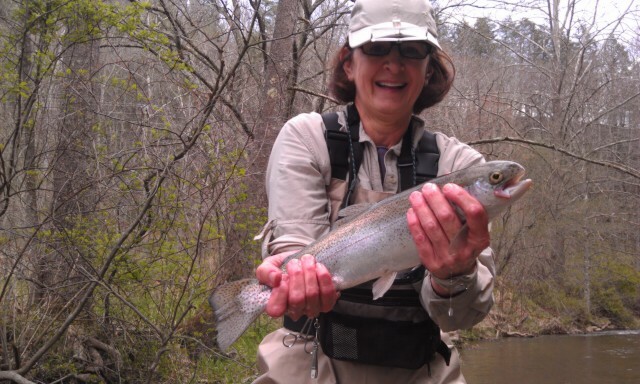 31,2012…..After some challenging fishing a few days this week today has been a welcome reprieve….we have done very well scoring about 20 fish before lunch, including a 22-23" rainbow landed by Melissa Malone. 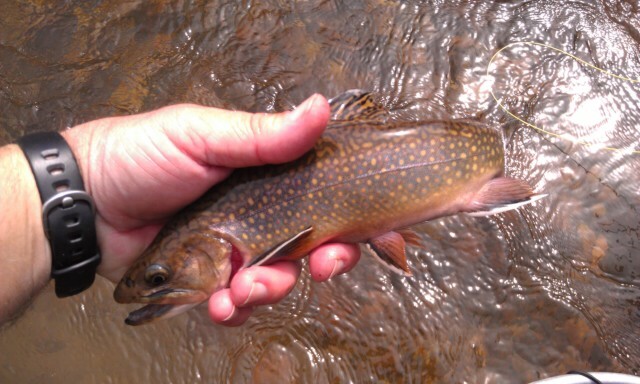 The water is up from thunderstorms and showers last night but it hasn’t bothered the fishing. We have caught all but one fish by nymphing. We got one kamikaze rainbow that slammed one of my krystal Buggers. Wet Start to The Weekend…. Sat. March 31, 2012……Waking up to an early morning rain , had a good trip yesterday as we put over 30 fish in the net. Headed out today guiding Melissa Malone and her party of three. Will be good today with a cloudy sky. Have a great Saturday…..more to come…..
Good Day, Still Challenging Fishing…. Fri. Mar. 30, 2012…..Hot, breezy conditions today and some showers early but we managed a decent day probably 30-35 fish for our group Brad Ball, Steve Lucey, and Steve’s friend David. We caught a mix of brookies and rainbows, 2 20inch hognose suckers, 2 smallmouth, and one redbreast. We are headed back, and I will be getting ready for tomorrow’s trip as I will be guiding one of my regular clients Melissa Malone and her group of 3. Expecting a good day, we are getting a really early start so we can be first up tomorrow morning. Have a great evening and weekend…! Thurs. Mar. 29, 2012….Gorgeous weather day today but wow, how windy it was…..guided Diane Bertrand today and we fished two different waters. We fought 30-35mph winds all day long and landed 15-20 fish. Water is still high and murky in a lot of our lower elevation waters and Delayed Harvest streams. That is a testament to how much rain we got over the weekend. We caught all our fishing nymphing, with the water levels that was our best option. Just getting in, gearing up for trips of the next two days. Should have more reports tomorrow. Will be playing catch up today with messages and fly orders and tying for some upcoming trips this week……..and also taking in a small dose of March Madness, all hoping my Heels survive if Kendall Marshall is again unavailable. Fishing is Good, Some Rain on The Way…. Fri. Mar. 23, 2012…Good morning……hope your week has been good, we’ve had some challenging days and some really good ones too. Guided Gregg Williamson, Jim Bryd, and Rick Mascia and we had a fantastic trip yesterday….we caught some huge fish ….check out our fishing reports page below to see some photos.. 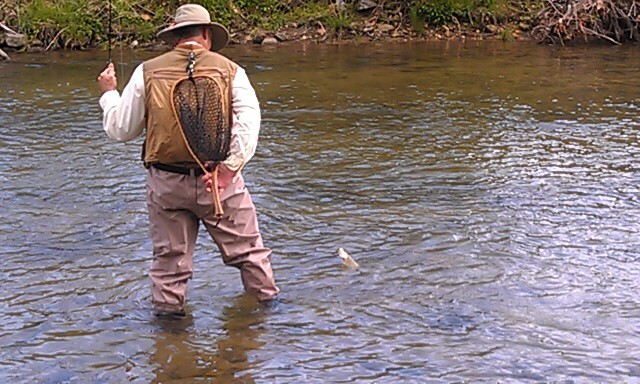 Looking forward to a good day today guiding Mike and Nate James We will be fishing some NC water. More to come…. 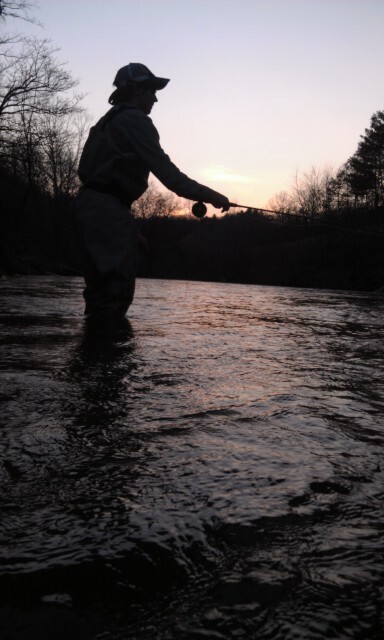 Good Fishing, Warm Weather Continues…..
Thurs. 22, 2012…..What a great day, guess you could say it was like redemption given the several challenging days recently. Guided Jim Bryan, Gregg Williamson, and Rick Mascia and the guys killed them today. I guided them on the Escatawba section of Dunlap Creek. 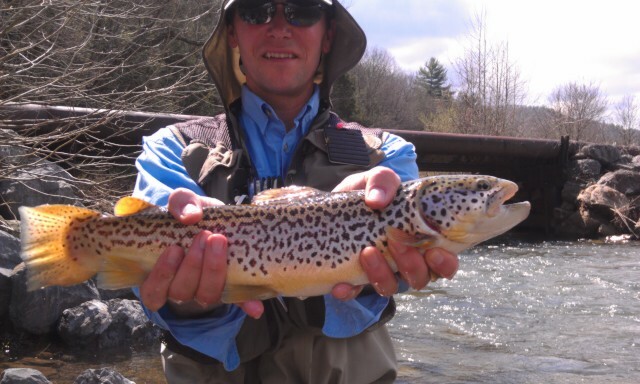 Numerous fish 20 inches or over, a mix of browns and rainbows. It was crazy good. 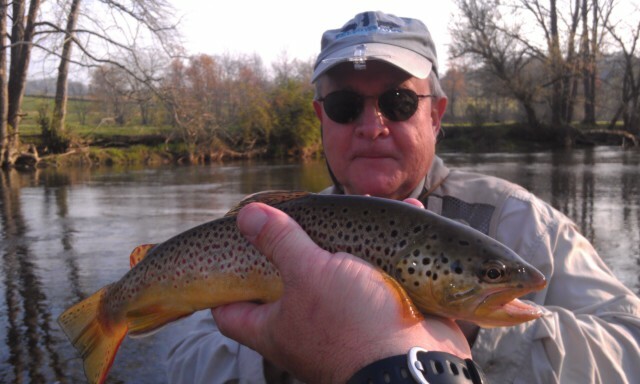 Gregg got one fish to eat a dry, the rest we caught on nymph rigs and stripping streamers/big uglies. We caught some gigantic bows….can’t wait to post pics from the trip. Guiding Tim and Mike James tomorrow, then Adam Harman from Winston-Salem ,NC on Saturday……looking forward to a great day….have a great evening. Thurs. Mar. 22, 2012…..Greetings and good morning. Nice morning, cool but that will be changing later as we are expecting highs in the 80s. Guiding Gregg Williamson, Rick Mascia, and Jim Byrd on the famous Escatawba section of Dunlap Creek. Expecting some large fish today, should be great fun. More to come…. Wed. Mar. 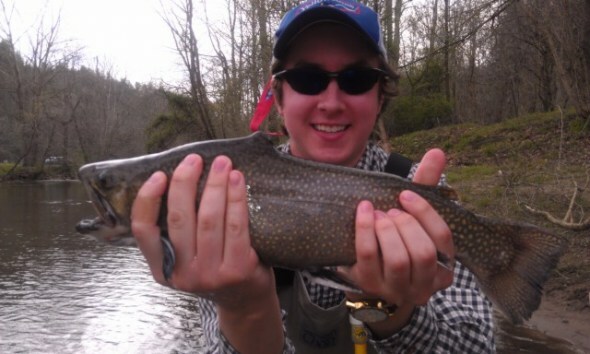 21, 2012…..What challenging fishing we have found lately, the warm temps are driving up water temps. Some waters have reached upper 50s to 60F. Those are May temps…. 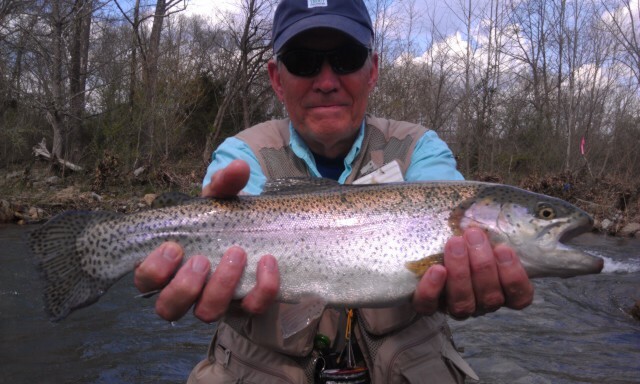 Guided Mike and Nathan James and we did a half day on the South Holston and a half day on NC water. 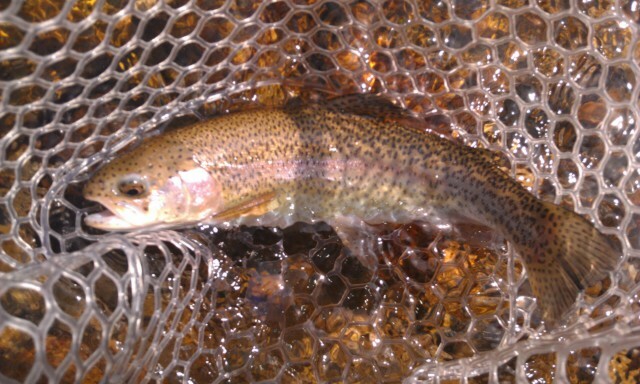 Fishing was tough on the SoHo, not many bugs coming off and very few risers. We caught a few and they were nice /larger fish but overall tough. Caught all fish on midges. Headed to lunch then over the Mtn to fish some NC water. The water was high and very off color. We nymphed and chucked streamers and big uglies and this worked well, allowing us to have a 15-20 fish day….and we were fortunate we caught them. Headed to Covington, VA to guide a 3 angler trip, Gregg Willliamson, Jim Byrd, and Rick Mascia Pk the Escatawba portion of Dunlap Creek.